I woke up around 3am to strong wind. It lasted an hour or so and stopped. I wonder if that’s a regular pattern out here. Since I wasn’t sleeping through the wind, I took that time to finish up yesterday’s blog entry. I have to say that I am happy with the new format of the blog now that I’ve switched over to WordPress, but the app for posting from a phone is terribly time consuming! Because of technical things I don’t need to delve into, I have to run my photos through another app so the files aren’t too large and they upload faster to the blog. Another completely different issue is that the app only allows me to upload photos if I’m online at the time. My old app through blogger had less quality results, but allowed me to put the photos in the offline draft so that all I had to do was hit send when I got service. Now, I have to load each photo individually when I have service. To be able to keep it all organized, I have to put the photos in daily folders (after running them through an app that reduces the size for quicker loading). When I get service, I have to plop down and take at least 15mins to load all the photos one at a time and add captions. Just organizing the photos for this process is tiring me each night, so I’ve been going to sleep many nights before I finish writing and finishing them in the morning or during a break during the day when I’m more awake and efficient. The end result looks great, but it’s cutting into my show watching in my tent this season and eating up more battery. Not cool. It also isn’t helping that it’s dark by 7pm out here. It takes me longer to do my nightly chores in the dark and I fall asleep a lot quicker. The days are getting longer, so that will improve. I finished up blog stuff around 4:30am and fell asleep again until sunrise. 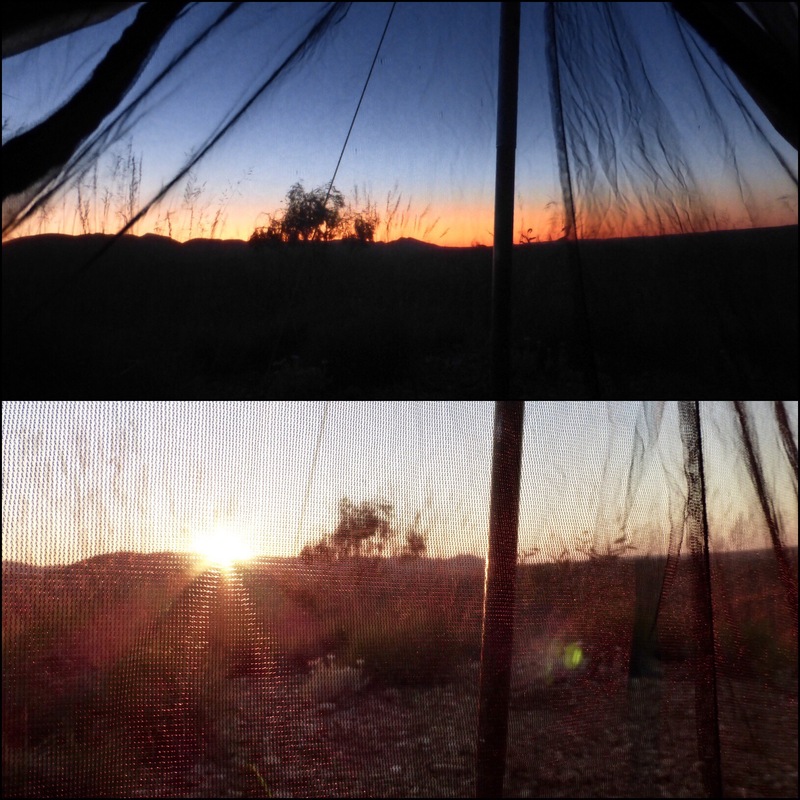 I watched it rise from my tent and lazily laid there (I’m still lethargic from my period) and left camp at 7:30am, which is late for me. I have been telling myself I have time and I get to sleep in, but I think I’m going to get up a bit earlier at least the next couple days. I don’t love moving in the early morning, but I do like the relaxed time during the day that an early start affords me. What I really don’t like about a later start is that it takes away a buffer for unexpected things that might happen in a day. That’s what happened to me today and I didn’t reach my intended endpoint, so now I need to make it up over the next couple of days. I kick myself for not getting up earlier and will tomorrow. Just 2.5mi/5km into today was an option to do a bonus side loop hike that was 5.2mi/8.4km. 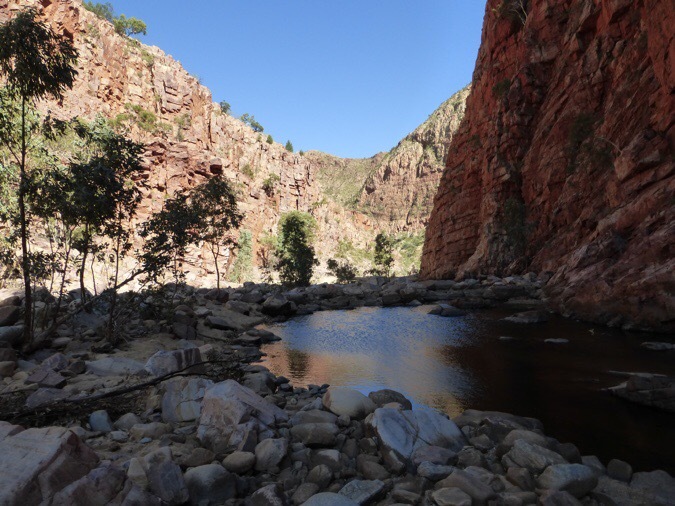 It was called the Pound Walk with Ormiston Gorge. So many people spoke highly of this loop that I decided to do it. I figured I have plenty of time this week, so I may as well see what I can. The hike took me almost two hours. I ditched my pack in the woods so I wouldn’t have to carry it for the loop and it felt amazing to walk without a pack on the trail. 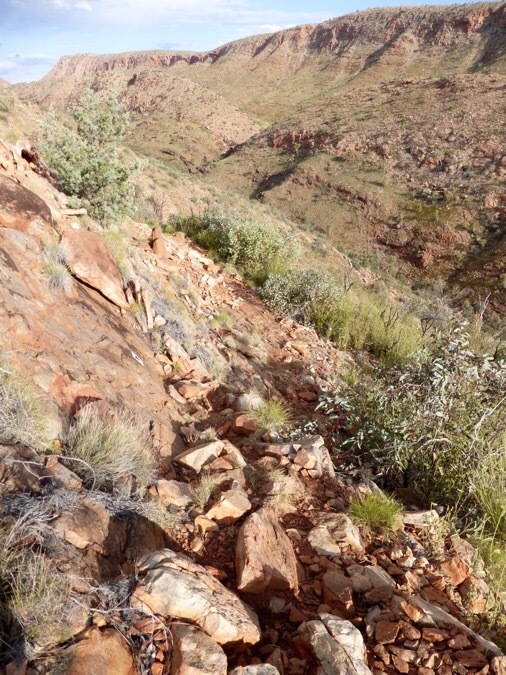 I have to say that I DO NOT recommend the full loop for Larapinta walkers. It was more of the same of what I’ve been seeing except for the last bit that went through Ormiston Gorge. I will go through more gorges on the actual Larapinta, but this one was cool to see. It’s just really rare to have natural water holes out here, so I think that’s why it draws so many tourists. Unfortunately, I did have to walk through water once and I got my shoes wet. 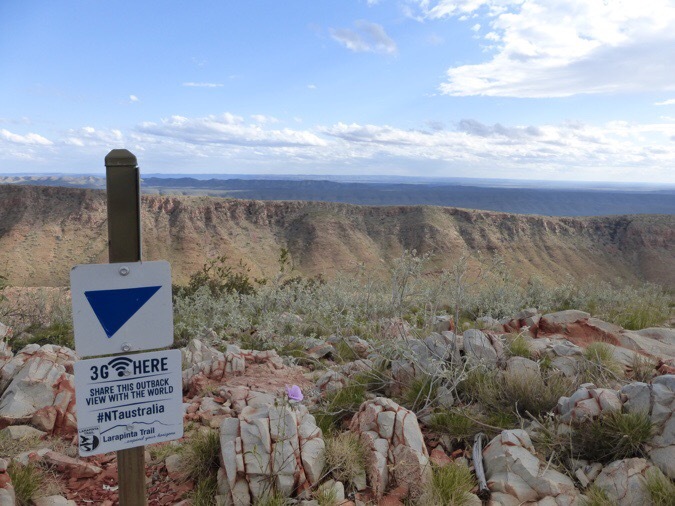 If I was to give advice to another Larapinta walker, I’d say just do the loop that goes into the gorge and up to a viewpoint. The water was low enough on that section (right now at least) that you’d get the experience without taking more than about an hour I think. 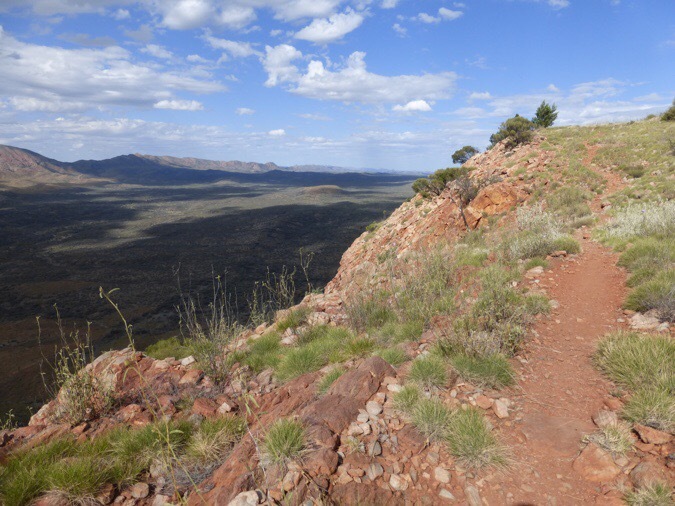 When I finished, I saw Peter at the visitors center next to the trailhead. 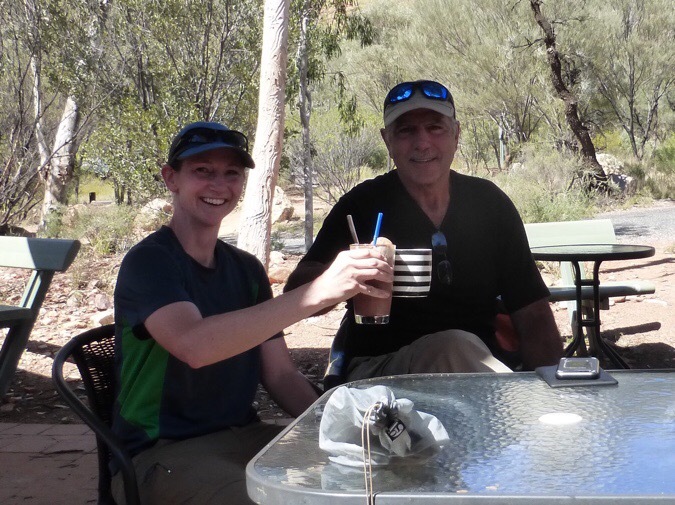 He was waiting on his ride to Alice Springs (he hurt his ankle) and will be heading to Uluru. Peter treated me to a coffee, which I don’t drink, and we tried for a chocolate milk, but the closest they had was iced chocolate. They made me Cadbury chocolate in water with a scoop of vanilla ice cream and ice. It was something very new for me. Check me out trying new things! I had an early lunch and dried out my shoes in the sun while I visited with Peter. He’s into IT stuff and had the guidebook on pdf and was able to airdrop it to me (in case I lose mine!). I might get to see Peter again around Christmas when I’m near Wellington in NZ. I was also able to plug some things in to charge. That was big since I’ve gotten more service than I expected and was conserving battery with how long I’m out here. Maybe I’ll have enough time and battery to watch some shows the latter half of this hike. 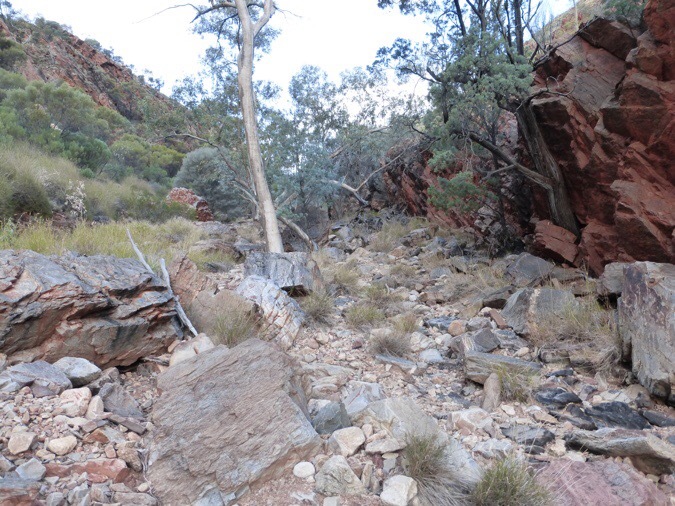 When I left Ormiston Gorge, it started the longest gap in water thus far. 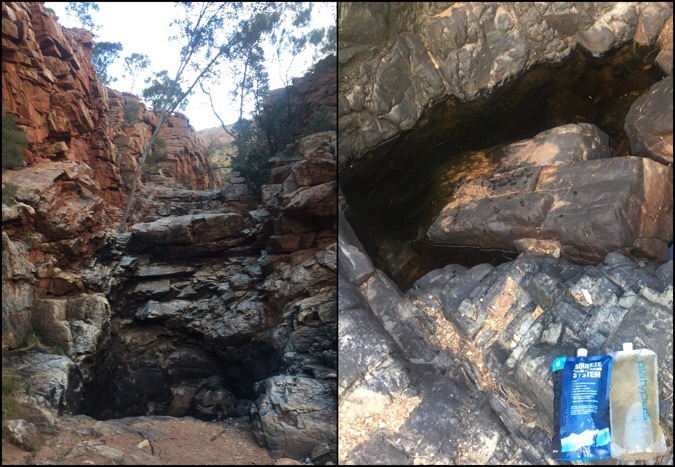 It was 9.3mi/15km to a small pool of water (my first natural source, not from a tank) that would be in another gorge. 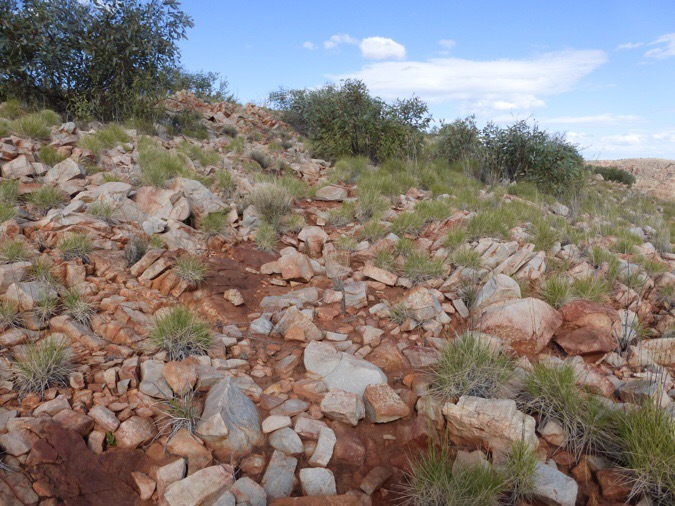 I saw a trio of Larapinta hikers hiking westbound as I left Ormiston and no one after that. 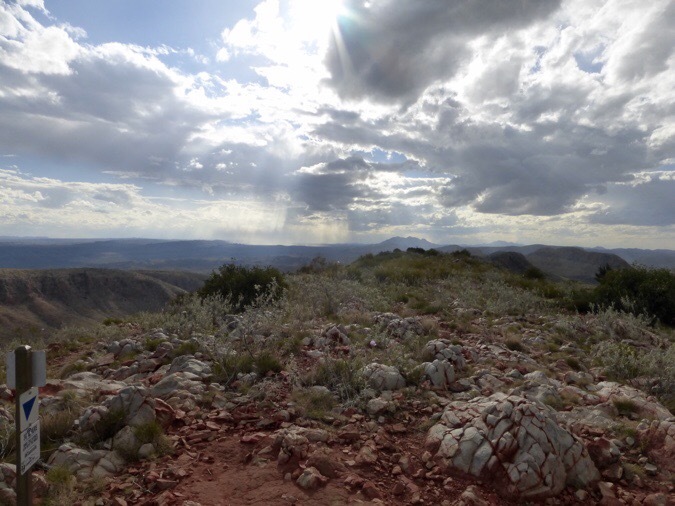 It was fairly brutal hiking in the afternoon with strong sun and very rocky uphill hiking that made for a slow pace. I was dripping sweat and mistakenly only took one liter of water for that stretch. I made it fine, but would have liked more water. Still though, my pack is quite heavy and felt like it was really pushing me down into the ground today in the heat. I’m just not 100% and my monthly lethargy with my period isn’t helping. It was tough and exhausting getting up to Giles Lookout. 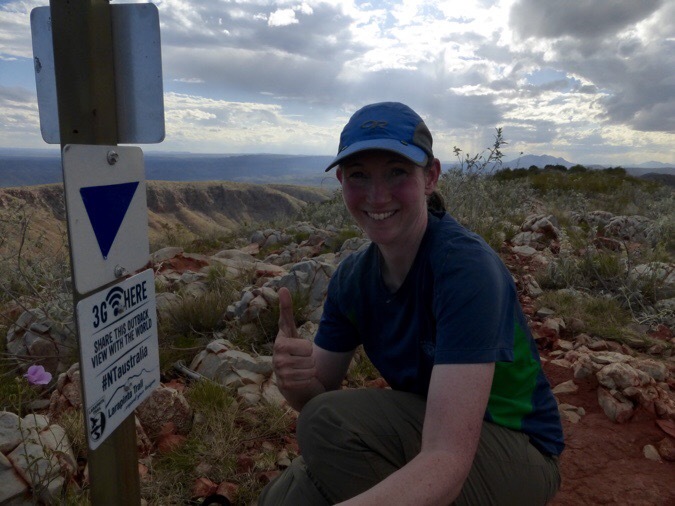 After some rocky switchbacks, the “trail” followed a cool ridge that was also quite rocky. It was painful on the feet and jarring walking on unfriendly rocks. I listened to music to distract myself best I could from the discomfort. Check out the sign at the lookout. I could get used to this! I spent 45mins online loading the blog and catching up on things. I booked my room at the hostel now that I for sure know my timing and the smaller room was already booked. I’ll be in the dorm room with 7 other women, dang! Yes, my earplugs will come in handy there I’m sure. Earplugs never work really well for me, but are better than nothing. I was really thirsty with just a couple gulps of water to get me to the next source 1.2mi/2km away and was wishing I had an extra liter up there to down. Just as I was finishing up, it started to rain a bit and a rainbow appeared. This dang trail. It gives me hours of brutal hiking and then a gorgeous view and internet to make me completely makeup for it and make me forget about it! I hustled down best I could but the rocks were even worse and terrain even steeper, so it was slow going. 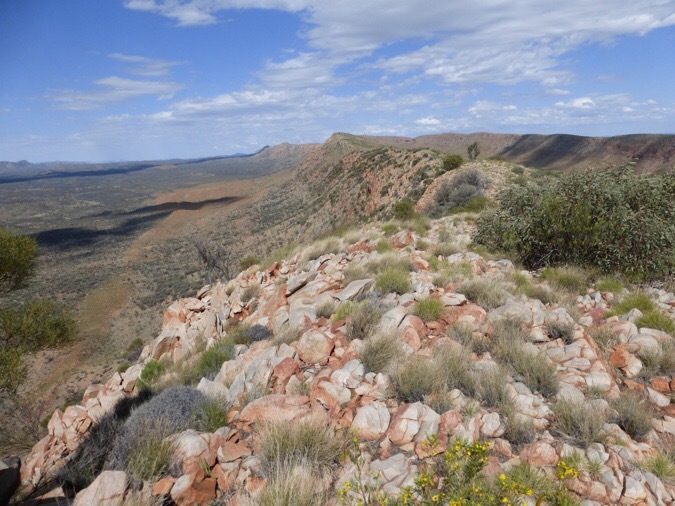 There is a lot of this to be expected on the Larapinta. It’s a tough hike and will give me a good challenge for sure. Rocky descent from Giles Lookout. 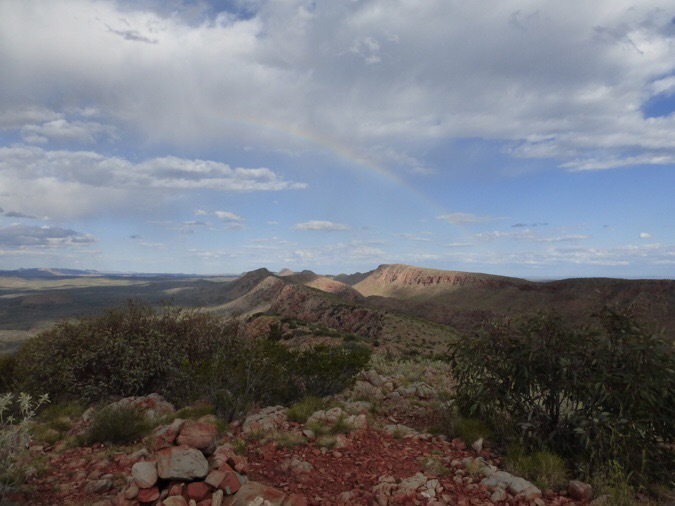 Just as I was swearing the trail and greatly parched, I looked up to see an even grander rainbow! Yep, I’ve got your number Larapinta. I see what you’re doing. I got to Waterfall Gorge, which deceivingly has a dry falls. There is a small pool of murky water to be found if you hike up the gorge a bit off the trail. Thankfully, I knew this from Peter who had understandably rolled his ankle coming down Giles and camped there. Also, Buck-30 mentioned finding water there in his journal back when he did this hike. I have his journal saved to my phone as a resource and it’s been great for knowing what to expect. If it wasn’t for this source, it would have been 18mi/29km between sources instead of the difficult 9mi/15km I had today. More rocks in the gorge. Waterfall Gorge and the small murky pool of water. It was quite time consuming to get to the water and scoop it out and bring it back down. By the time I finished, the clouds were really getting dark and I realized I should stop early instead of heading to my more exposed intended stopping point for the day about an hour away. 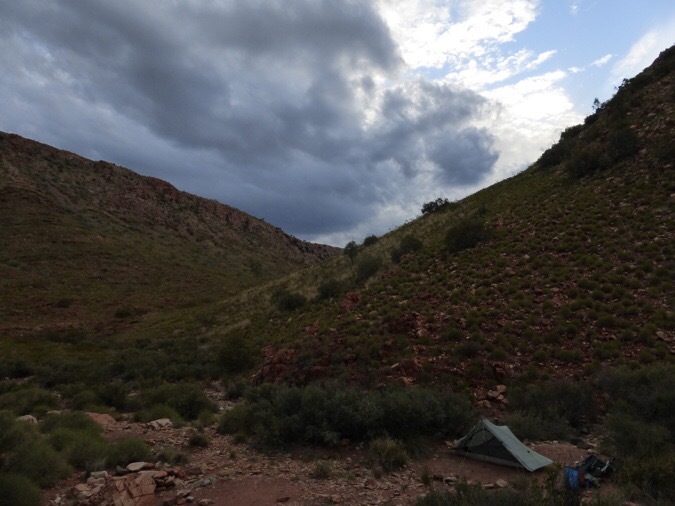 It was 5:45pm and I set up camp quick as the clouds came in and wind kicked up. Just twenty minutes after I got the tent up, thunder rolled and the rain came down. I was so glad I had made the right decision to stop when I did! It rained for 40mins and came down really hard for 15mins. 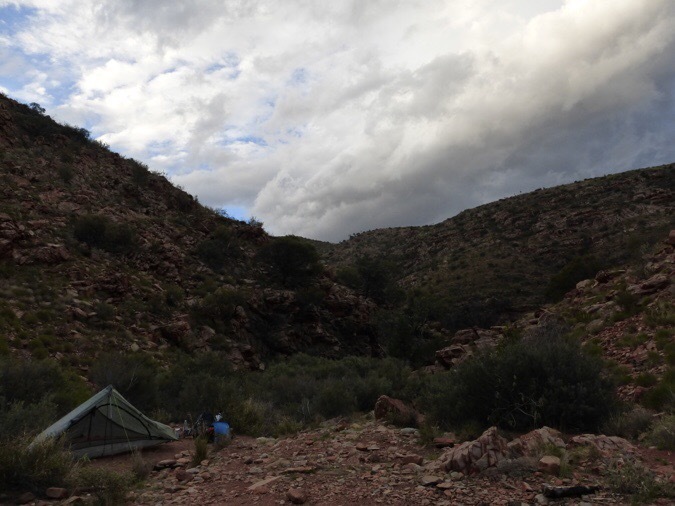 The rain was so hard and wind so strong that I was steadying my tent by holding the poles. This tent is amazing and stuck it out great! I had my one dehydrated meal I was saving for a night like tonight when I didn’t want to cook and clean and it was greatly enjoyed. I need to find more of these out here. I miss my easy Mountain House dinners, which can’t be bought here. I need to look into what they do sell here for dehydrated dinners. Welp, that’s it for this tough day. Tomorrow looks to be just as rocky and slow going, so I’m going to get up a bit earlier and hopefully make more progress to make up some of what I lost today. The weather is all over the place the rest of the week it seems and I think that will greatly determine my mileage each day. I was hoping the rain would cool things off, but it’s still quite warm and muggy making for sticky sleeping. Whew, I’m tired! In the US there are so many dehydrated food options … there must be something you can find. Wish I could have sent you some of the big food-service size #10 cans with you! I would have LOVED to bring those and maybe I could have. I just didn’t want to buy it and risk it being taken away. I did just get some of the dehydrated meals out here and I’ll be testing them out for half my meals this coming month on the Bibbulmun. September is Emergency Preparedness month in the US with lots of sales happening online. I did a few quick searches on freeze-dried meals made for distribution in Australia and found three brands: Outdoor Gourmet Company, Back Country Cuisine, Happy Camper Gourmet. Here is a link to what looks like a major outdoor supplier too! I did get a bunch of Backcountry Cuisines and one Outdoor Gourmet to try out for the Bib. They are pricier than ours in the US and look less bulky. We’ll see if they do the trick. Those rocks look gruesome, Yikes! Are you enjoying a harvest moon in the southern hemisphere? It was pretty great! No headlamp needed at all. Australia has four brands of dehydrated food: Happy Camper, The Outdoor Gourmet, Back Country Cuisine, and Camp Cooking to the Extreme. The prices are comparable to Mountain House after adjusting for the exchange rate. They are a bit pricier, but I did decide to test out the Backcountry Cuisine and one Outdoor Gourmet for the Bib. Half my meals will be these over the next month and it will be a good test run. I miss my Mountain House! That country looks so much like Arizona it’s amazing. That’s what many are saying. It just feels so vast compared to what I remember in Arizona. 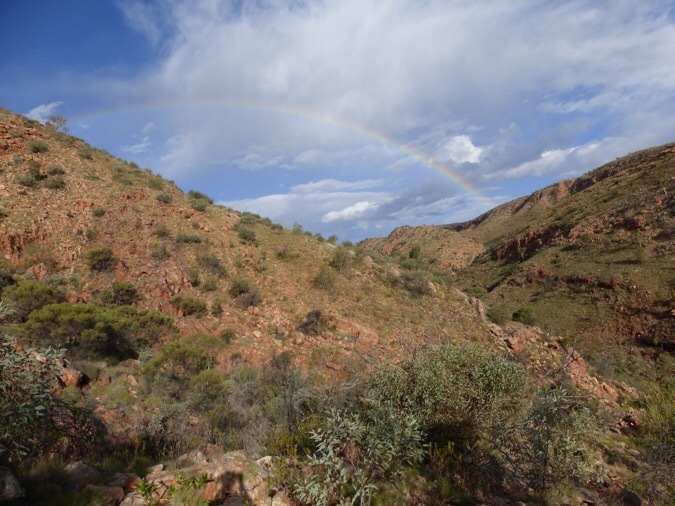 The rainbows are beautiful and the trail looks challenging and the weather seems to like to keep you on your toes!! Good luck with the remainder of this trail. Plenty of options for local dehydrated foods in Oz. Or the local hiking camp shop in Alice has stock to try. I decided to go with some Backcountry Cuisine ones for the Bib and will be reporting how those compare. The rainbow pics are awesome! Try Strive Good. Local Tasmanian company. Good quality at reasonable price. YOu looking for anything Hiking (or as we call it in OZ; Bushwalking or in NZ Tramping) go to a great forum. Well, this wired trail suits Wired just fine! (except for the rocks, argghhh) The rainbows are beautiful and I did notice the resemblance of the surrounding country to Arizona that Farwalker mentioned. It is quite beautiful. How did the Chocy milk float taste? I don’t know how you ever find the time each day to blog for us. Thank you for investing even more effort to include the high quality photos, too. That said, perhaps you could get back some of that time — by uploading selected pics en-mass to a service like Google Photos or Apple Photos and just give us a link to them? Or enlist one of us from your (ever growing!) fan base to insert them into the posts for you? This also is a journal for myself that prints out as a nice keepsake, so I love the photos in the text.